Reading Donna Bell’s Bake Shop Cookbook inspires me to share my New York origin story – or more importantly how I met Darren Greenblatt – one of the writers and co-owners of the eponymous bakery. My older sister’s best friend went to FIT with Darren so he was one of the first people I met when I moved up here to go to school – not that I think I made much of an impression. I was too intimidated by their hard won city cool acquired over the 4 whole years they’d lived there before me. Part cookbook and part memoir, DBBSC is all about first meetings as it tracks the friendship history between Darren and his partners Pauley Perrette and Matthew Sandusky. It’s very much about being young and new in a city and the families you form. If they get along with your parents (and everyone gets along with the Greenblatts), then they’ll always know where you’re coming from. If they help you build a bakery to honor your mother (Donna Bell’s is named after Pauley’s mother who was a wonderful southern cook) then you’ll always have something in common. Fortunately, both my sister and Darren are really good at maintaining friendships no matter how busy or upended things get. We’ve seen Darren move from fashion to the kitchen (albeit a fashionable kitchen), move in with his brilliant boyfriend now husband Sam (a dashing, quotable Southern academic), and bring up their too cute daughter Olive (who really needs to star in her own book). Coordinating schedules is hard, so it’s always great to know you can stop by Donna Bell’s and catch Darren serving out what can only be described as honkin’ big slices of cake to customers. I was almost sad to think I could just make their recipes at home instead. Almost. 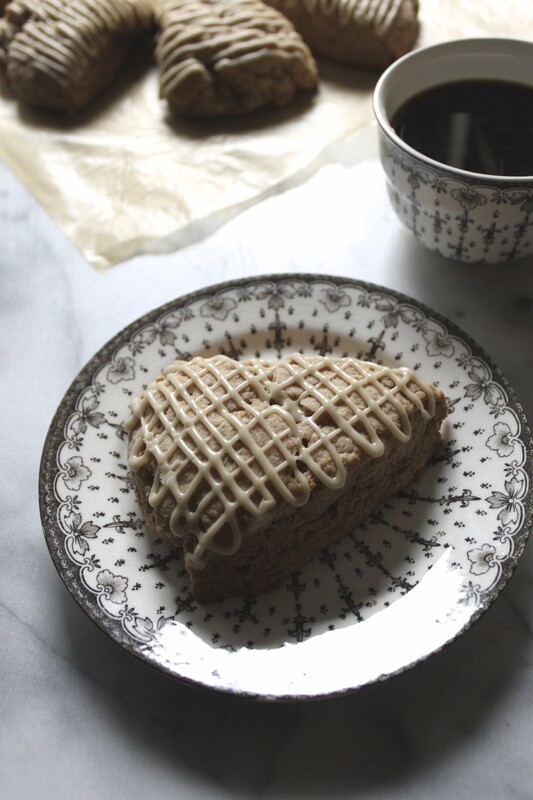 I’ve always been partial to the biscuits and scones so on a rainy day I tried their cinnamon scones with maple glaze. Donna Bell’s portions are pretty generous so I decided to make this recipe post a giveaway too. For the last few weeks, I’ve been testing out Community Whole Bean Coffee. I’d tried it for the first time last year when I was visiting southern Louisiana, so when they offered to send me a few different varieties I jumped at the chance – especially when I realized it was family owned and operated. They’re also offering (3) bags of whole or ground in your choice of blend to one of my readers. To enter to win, you only have to leave a comment below between today, Wedenesday, April 22 and next Thursday, April 30 at midnight (EST). It’s not required, but if you’d like to share the name of your favorite neighborhood bakery, that would be fun too. Please note the following: one winner will be selected at random, there is only one entry per person, the prize must be shipped within the United States, and must be claimed withing 72 hours or another winner will be selected. Disclosure: I received a small amount of product to sample in advance but was not paid to host this giveaway and the opinions expressed are my own. I made these scones on with only the rain as an excuse. Darrren might kill me for saying this because I know they make everything at Donna Bell’s fresh daily but the pre-baked scones actually freeze really well and can go directly from the freezer to the pan of extra minutes baking time. Excerpted from Donna Bell’s Bakeshop: Recipes and Stories of Family Friends and Food by Pauley Perrette, Darren Greenblatt, and Matthew Sandusky, courtesy of Simon & Schuster (Copyright Pauley Go Lightly Productions). In a large bowl, combine the flour,sugar, baking powder, baking soda, and 2 tablespoons of the cinnamon. Add the cold butter pieces and quickly press between your fingertips to break up the butter and incorporate it into the flour until the mixture resembles coarse crumbs. Place the milk, heavy cream, sour cream, and vanilla in another bowl. Whisk together until the sour cream is fully incorporated and the mixture is smooth. 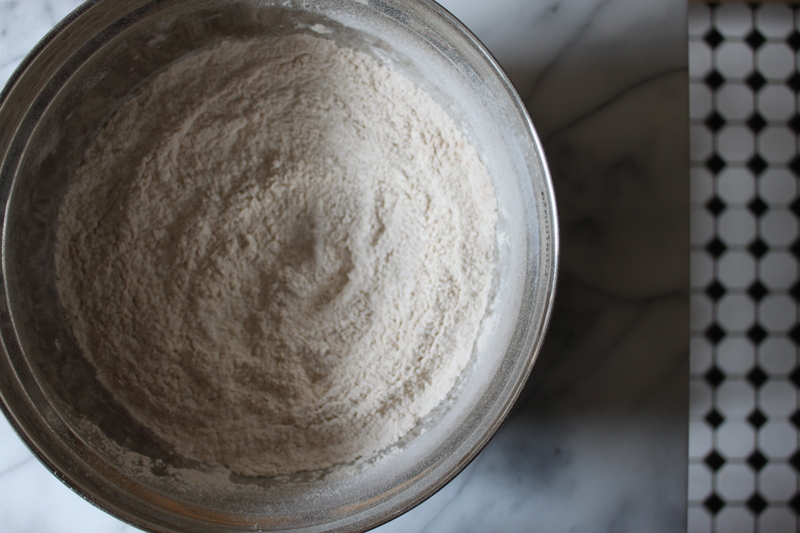 Make a well in the flour mixture and pour in all the liquid. Mix with a wooden spoon until the dough comes together. Do not overmix. Cover the bowl with plastic wrap and refrigerate for 2 hours. Heat the oven to 400ºF. Line 2 baking sheets with parchment paper. Lightly flour a work surface and place the dough on it. Cut the dough into two equal pieces. Wrap one piece in plastic wrap, an set aside in the refrigerator. Press the dough down with your fingertips to flatten to an 8-inch circle, about ½-inch thick. Sprinkle with 1½ teaspoons of the reserved cinnamon. Cut the circle into the equal wedges and place them on one of the prepared baking sheets, about ½-inch apart. Bake until golden brown, 15 to 18 minutes. Let cool for 5 minutes, then frost with ½ of the Maple Glaze. Serve warm. Repeat with the remaining piece of dough 1½ teaspoons cinnamon, and remaining Maple Glaze. In a bowl, whisk together the sugar and maple syrup until smooth. I would love to try this out. Thank you! I get up (on my sailboat in El Salvador ) at 5:30 a.m. to enjoy my favorite time of day…sunrise with freshly ground dark roast coffee. 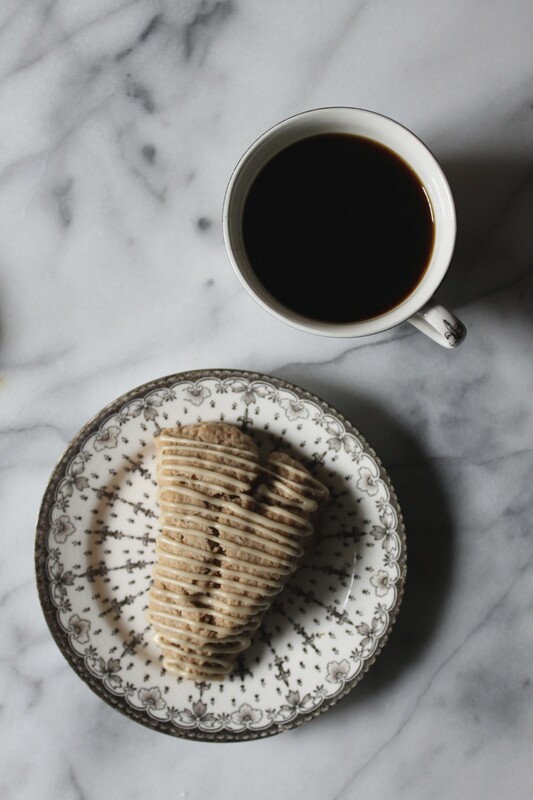 Before the heat of the day, before any interruptions of tranquility and to think how even more perfect it could be with maple glazed scones… I salivate in anticipation. Thank you for another lovely post…and referring back Dogs are the nicest people, keep up the great work. This is awesome! I love Coffee Talk in Honolulu. It is close enough to my house that I can walk but far enough away that I don’t feel bad eating a massive piece of butter mochi. They are a coffee shop not a bakery but they do serve wonderful pastries as well. Yum. Looks delicioso. My favorite bakery used to be the panaderia man who used to have the ovens in his house and bake bread early in the morning. He lived next to my abuelos in Phoenix, Arizona. He was known as Mr. Mejia! He would give us free bread when we would go over. I will be trying this recipe soon, it looks delicious!! 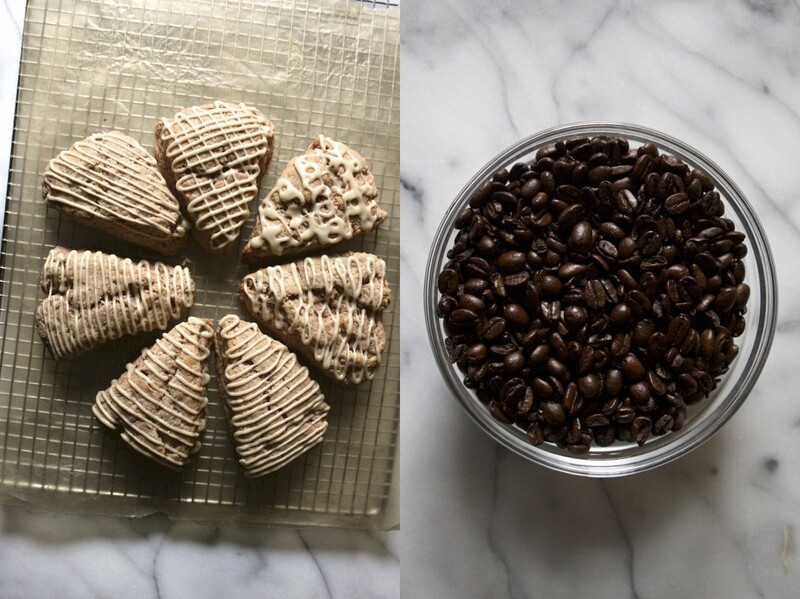 What is better than fresh coffee and scones?? Absolutamente nada. MY favorite bakery is called the Koffee Kup they have the best pasteries. Must try this recipe. The scones look amazing! My favorite neighborhood bakery is a place called the Jaho in the South End of Boston. They have amazing coffee and even better pastries. Reblogged this on Cirque Desserts. This recipe looks delicious, I am definitely going to try this. Community Coffee is my husband’s favorite. Thanks. I want to try the Vanilla Creme Brulee. I’d like to try their Dark Ground Roast. Best bakery here is called Sweet Passions Bakery! Good name for it, too. Just started following you, what a beautiful site. These look beyond delicious and are getting made….now! These look absolutely delicious!! My favorite bakery here in Dallas is a lovely and quaint little place called Main Street Bistro.